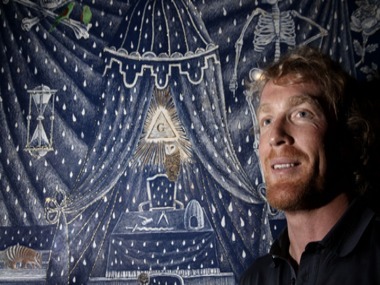 2009 Telstra Award winner Danie Mellor pictured with his mixed media on paper, From Rite to Ritual. Entries for the 27th Telstra National Aboriginal and Torres Strait Islander Art Award opened to Indigenous artists nationally on Friday, 19 February and close Friday, 2 April 2010. The Telstra Art Award is the longest running art award dedicated to the work of Aboriginal and Torres Strait Islander artists and is considered the premier national event in the Australian Indigenous arts calendar. The Telstra Art Award comprises the $40,000 Telstra Award and category Awards including; the Telstra General Painting Award ($4,000), the Telstra Bark Painting Award ($4,000), the Telstra Work on Paper Award ($4,000) and the Wandjuk Marika Memorial 3D Award (also sponsored by Telstra). In 2010 the Museum and Art Gallery of the Northern Territory (MAGNT) and Principal Sponsor have announced the Inaugural Telstra New Media Award ($3,000) with the theme of ‘Connections’. New media works can range from conceptual to virtual art and could be in the form of installation or mixed media presentation, as long as the work involves a new media component in the creation and presentation of the piece. In order to provide new media artists with the best possible opportunity to enter this category in 2010 the entry period has been extended with the closing date for the Telstra New Media Award now set to close on Friday, 30 April 2010. The closing date for all entries is Friday 2 April except for new media entries which close on Friday, 30 April.